bLondon Symphony Orchestra/Sir Charles Groves. 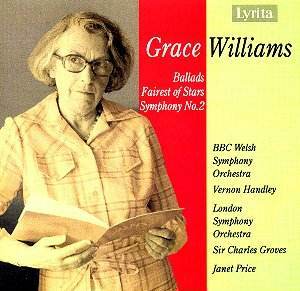 The Welsh composer Grace Williams has been unfairly neglected by concert promoters and record producers alike. A pupil of both Vaughan Williams and Egon Wellesz - and very nearly assistant to Britten, declining his invitation - she returned to her native town of Barry, near Cardiff, after the Second World War. It was there that she spent the rest of her life, composing mainly by commission from the National Eisteddfod and Llandaff and Swansea festivals. It is perhaps by placing herself out of the British metropolitan musical mainstream that Williams� work has so often been sidelined. On the strength of the music on this disc - from BBC and EMI originals - it is time for serious reappraisal. The earliest of the three works, the Second Symphony (1956, rev.1975), is also the most ambitious. The first movement, Allegro marciale, immediately proclaims debts to other symphonic composers. The persistent side-drum, trumpet fanfares and unison wind accompanied by pizzi-staccato strings are highly characteristic of Shostakovich�s symphonic output. Likewise the violent, militaristic quality harks back to Vaughan Williams� Sixth Symphony, whilst the macabre waltz-like sections (replete with swooning solo violin) recall the shadowy world of Mahler�s Seventh. Yet if the elements are suggestive of others, the binding together of the different strands are Williams� achievement. After the opening, she soon reveals a romantic streak all of her own, without ever being sentimental. The rhythmic tension that the composer generates grips like a vice, subtly changing from 4/4 to 6/8 and frequently adopting cross-rhythms. The development section is tautly constructed, throwing principal ideas together into a complex but always lucid texture. Indeed, the trumpet fanfares from the opening permeate not only this section but the movement in its entirety. The Andante sostenuto that follows is rather more gentle, but no less bleak in its outlook. The stark opening has a plaintive oboe melody set against drone strings. Constant fluctuations between major and minor reflect the chromatic melody lines which rarely open out but instead tug one way or the other. Most of the melodic movement is built upon simple stepwise ascent or descent. The movement is immensely compelling all the same and the orchestration clearly helps-a prominent timpani rhythm and quiet tam-tam are menacingly present throughout. Williams provides some respite in the conclusion to this movement, coming to rest firmly in the major. The ensuing Allegro scherzando, however, returns to the violently grim nature of the first movement. Scurrying rhythmic motives and frequent metric shifts generate a huge amount of excitement. A fleeting, slower central section is still incredibly dark, with ominous slitherings in the clarinets and biting trumpet interjections. The rhythmic vitality of the third movement is offset by the Largo that follows. The opening of this movement sees Williams in obvious late Romantic guise; in both sonority and harmony this is reminiscent of the Adagio of Mahler�s (then) incomplete Tenth Symphony. The simultaneous sounding of major and minor chords reflects the struggle of tonalities that has permeated the whole symphony. Later, the side drum and trumpet motives from the first movement return, leading to waves of climactic - though still troubled - lyricism, before a sudden, quick ending. Ballads (1968) is unmistakeably the work of the same composer yet, freed from the conventions of symphonic forms, Williams seemed less inclined to display her influences. Three of the four movements take a single melody and repeat it within different orchestral and textural contexts. The melodies often take on an improvisational quality and the accompaniments show the same sense of imagination as in the Symphony. This is an essentially dramatic work, designed to reflect different aspects of Welsh culture and history. Whether or not it succeeds on such a level is unclear; nevertheless, it is still highly compelling. Both of these works are exceptionally well played by the (then) BBC Welsh Symphony Orchestra under that tireless advocate of obscure British orchestral music, Vernon Handley. The sound is acceptable, though the Llandaff studio acoustic is rather dry and airless, resulting in some congestion. �Big� works such as these should ideally sound more expansive. No such concerns apply to the 1973 (EMI) recording of Fairest of Stars. The sound here is as opulent and expansive as one could wish. Indeed, the work itself - composed specially for the recording - is an even finer piece than the Symphony. A setting of lines from Milton�s Paradise Lost, this is a rhapsodic, ecstatic work that is totally distinctive from those of other composers. The soaring, melismatic vocal line is extremely well delivered by Janet Price. Her rapid, flickering vibrato only adds to the sense of wonder and barely contained excitement, and she is sensitively partnered by Groves. This is a work that demands to be heard and, given its highly idiomatic vocal writing, one that certainly deserves to be performed more often. This disc is certainly an ear-opener. If the idiom appeals then much satisfaction will be gained from exploring this fascinating repertoire. As the only available recordings, they would be a first choice even if the performances were poor. Fortunately the disc is both very well performed and more than adequately recorded.